U.S. Marine Lance Cpl. 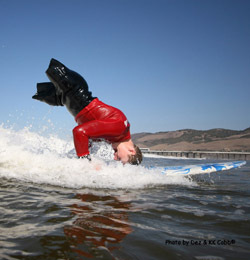 Travis Dodson of Deming, N.M., applies his brain while learning to surf in Pismo Beach, Calif., in late September. The surf camp for wounded veterans was partially hosted by Marc Mast and the Wood River Ability Program, based in Ketchum. "Surfing was a blast," Dodson said from the Brook Army Medical Center in Texas, where he is rehabilitating his injuries. "This was my first camp." Dodson, who underwent a bilateral, above-the-knee amputation, was injured near Haqlaniyah, Iraq, on Feb. 14, 2007, when an insurgent hurled a grenade through the second-story window of a house in which his squad had just set up a post. Dodson turns 22 this Saturday, Oct. 14. Modern boomtowns boom because they?re ?nice places?